Dynamite Entertainment and Groupees are doing a horror-heavy digital comics bundle for fans of the classic Bruce Campbell film, Army of Darkness. The AOD Build-a-Bundle is designed to allow fans to pick the issues they want or collect all 111 digital comics for only $19.93 (the release year of Army of Darkness). You can find this bundle here. 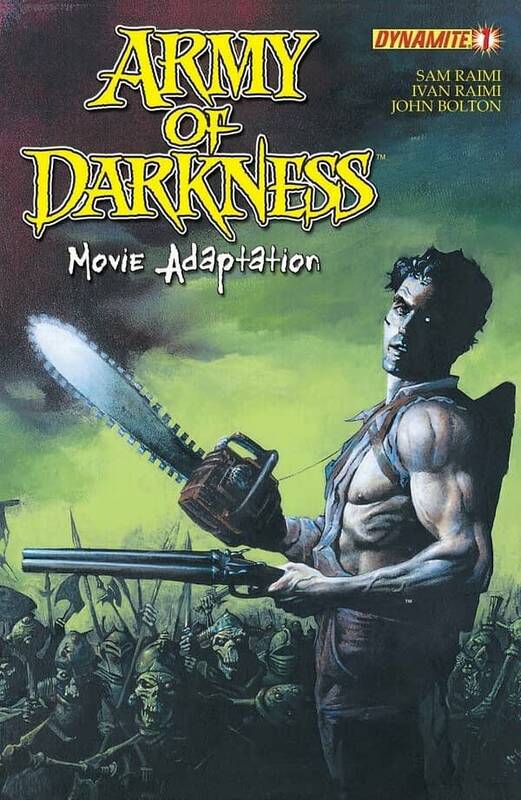 To help promote that bundle, they’ve sent over a couple of Army of Darkness comics for us to share with our readers and we’re starting off with the first issue of the movie adaptation. I remember seeing Army of Darkness for the first time. I’m not a huge horror fan, so it wasn’t on my radar, but the girl I was dating was and really wanted to go. So I went and enjoyed the hell out of the film. I didn’t realize that Dynamite, who has been publishing Army of Darkness comics for a while, had John Bolton adapt the screenplay by Sam Raimi and Ivan Raimi. Here we have the first issue for you to read. In horror movies, it’s usually the killer that becomes the iconic character, but here it’s the hero — or sort of hero — who everyone loves. Who doesn’t love Ash Williams or Bruce Campbell who made him famous?